and additional text from the Book of Mormon, Doctrine and Covenants, and the Pearl of Great Price. in an easy-to-follow, color-coded format. Click here to purchase the book. "As I am a messenger of Jesus Christ, and knowing that many have taken in hand to set forth in order a declaration of those things which are most surely believed among us; ... It seemed good to me also, having had a perfect understanding of all things from the very first, to write unto thee, in order, most excellent Theophilus," (JST Luke 1:1,3). Luke was a witness of the ministry of Jesus Christ, our Savior. So were Matthew, Mark, and John. These New Testament writers knew his teachings and his perfect example. As apostles and messengers of the Lord, they were appointed by God to teach others of his doctrine and to testify that Jesus of Nazareth is the Son of God. Each of these authors used different approaches to write about the life of Jesus. John wrote primarily on the last week of Christ's mortal ministry, while Matthew included many references to Old Testament prophecies which he applied to the life of our Savior. Luke emphasized that Jesus felt compassion towards and came to heal the poor and downtrodden. And Mark wrote a short account emphasizing Christ's power as our Savior. The combination of these accounts gives us a broader understanding and knowledge of Jesus Christ and the events that transpired in his ministry. However, these inspired authors were more interested in the doctrinal content of their writings than the chronological order. For a student of the scriptures, this makes understanding the correct order of events challenging. A harmony of the four Gospels solves this problem by tying together and clarifying the life and teachings of Jesus Christ into one great picture. Gospel harmonies began to be written soon after the era of the original apostles. The earliest of these harmonies, Diatessaron, was compiled by Tatian in the latter half of the first century a.d. Another early Gospel harmony was written in about a.d. 325 by Eusebius, a historian of the Catholic Church. Since chapter and verse divisions did not exist in the scriptural accounts of that day, he formulated his own system to group parallel scriptures from the four Gospel narratives. Since that time, there have been many other harmonies compiled. Some of the more recent ones include A Harmony of the Gospel for Students of the Life of Christ by A. T. Robertson (Baptist), which uses the American Standard Version of the Bible and places the Gospel of Mark first; A Harmony of the Synoptic Gospels in Greek by Burton and Goodspeed (Baptist), which utilizes just three of the Gospels and the Greek text of the Bible; Synopsis of the Four Gospels by Kurt Aland (unaffiliated), also drawn from the Greek text; and The NIV Harmony of the Gospels by Robert L. Thomas and Stanley N. Gundry (Christian), which makes use of the New International Version (NIV) of the Bible. The list goes on. A handful of harmonies have also been written by members of The Church of Jesus Christ of Latter-day Saints. First in this list is Our Lord of the Gospels by J. Reuben Clark, Jr. In the preface of his book, President Clark mentions that various harmonies were used in its completion, such as those written by Edward Robinson, Samuel J. Andrews, and George W. Clark. While care was given to put events in chronological order, he clearly states that the "teaching and doctrines [of Jesus], these are the things that are important." In addition, he states that his book "will indicate the fact (which some of our own scholars seem to hesitate to adopt) that the Gospels do contain the life history of Jesus, who had a real personality." In the book, President Clark groups parallel passages of the four Gospels in sections along with a brief explanation of those scriptures. The Mortal Messiah, a four-volume work written by Bruce R. McConkie, largely follows the chronology used by J. Reuben Clark, Jr. In these volumes, Elder McConkie cites a group of parallel passages at the beginning of each chapter, after which he writes a commentary about those scriptures. Also, at the beginning of chapters, he often includes modern scripture from the Book of Mormon and the Doctrine and Covenants. These quotes shed further light upon the events of Christ's life. The New Testament: with the Joseph Smith Translation, compiled by Steven J. and Julie M. Hite, focuses on adding the changes made by Joseph Smith in his Inspired Translation of the Bible to the existing King James Version (KJV). The Hites show each Gospel in parallel columns across the page and use bolded text to show inserted words and phrases from the Joseph Smith Translation (JST) and strike-throughs to delineate deleted text. Combining the harmonies of Elder McConkie and President Clark as well as the JST, Todd G. Andersen's The Gospels Made Whole presents the four Gospels in a continuous narrative account. He also includes some excerpts from the Book of Mormon and the Doctrine and Covenants along with some commentary on the four Gospels. However, The New Testament: with the Joseph Smith Translation and The Gospels Made Whole follow different chronologies than those used by President Clark or Elder McConkie. In addition, James E. Talmage in his book Jesus the Christ used yet another chronology. The variance of opinion seen among the many harmonies of scholars and members of different religions also exists here. No chronology seems to be accepted by all authors. These efforts will help the reader gain a clearer picture Christ's life. To achieve a fluid reading of all four Gospel narratives, the chronology of The Mortal Messiah was closely followed. However, rather than place parallel scriptures in a group, they were woven together to create a continuous narrative, as if one person were retelling the life of Christ from what multiple people had told him. In weaving these texts together, the scriptural accounts have been rearranged but not altered and no commentary has been added. The Inspired Version published by the Community of Christ was used to incorporate the fulness of the JST, including punctuation and verse references from the JST. Furthermore, the words extracted from each Gospel have their own distinct textual style which allows the reader to easily identify the author of any given word or phrase. This process has created one accurate and original Gospel from the four. the text that was most easily understood. To address the second area of improvement, namely integrating modern scripture into this Gospel harmony, all scriptures that shed further light upon Christ's life were included from the Book of Mormon, the Doctrine and Covenants, and the Pearl of Great Price. These scriptures give an additional understanding of what Jesus meant when he taught or what happened in his life. 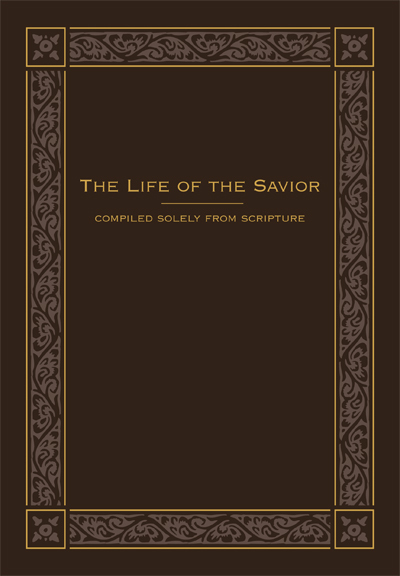 The Life of Christ: from the Joseph Smith Translation of the Four Gospels with Modern Scripture paints a vivid and insightful picture of Christ's mortal life. This book is a tribute to Jesus Christ, the Savior of the world, the chief cornerstone of the Gospel, the Lamb of God, and the author of every good thing. It testifies of his perfect life and has helped me to better know him.